Further Adventures in Head Carrying in Ireland and beyond! There’s a story in my family about the time that late father bought a white car. It was in the early 1990s and no one had a white car. Well, that was the opinion of the rest of the family – I’d never seen one driving about! White cars are pretty distinctive – they’re the type of thing that one would definitely notice. We were quite confident that, despite my dad’s reassurances, we were the owners of one of the few white cars west of the Shannon. It may, perhaps, have even been unique. Or so we thought! We hadn’t had it long when we noticed other cars of the same colour out and about on the roads. Where had these cars been hiding? Were we riding the crest of some white-car fashion wave? … OK … maybe not the last bit! What has always interested me in this story is how it is possible to be in complete ignorance of the existence of evidence, right up until you see one example … then you can’t help but see it everywhere you look. Postcard in the collections of the NLI, c.1905. Something of the same happened to me a little while ago, when I published a piece in this blog about head carrying in Medieval Waterford and Modern Galway. I had wanted to put on record what seemed to me to be a pretty rare occurrence of head carrying in Ireland. No sooner had I published the post, confident in the knowledge that I was discussing something relatively rare and unusual, when I was contacted by the sculptor, Séighean Ó Draoi, who drew my attention to a photograph in the collections of the National Library of Ireland. 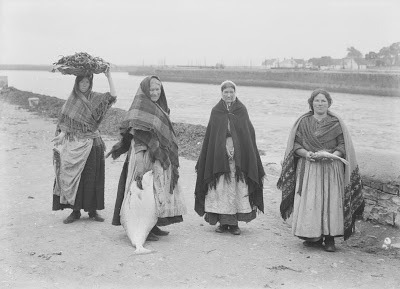 The photograph was taken near the Spanish Arch in Galway city and the Claddagh village may be seen in the background, across the River Corrib. The image is of four women, dressed in traditional shawls; one of whom is balancing a low-sided wicker basket filled with what looks like seaweed on her head. The photograph is from a postcard, printed in Berlin, and dates to around 1905. This is just about the time my great-grandmother, Honor Mannion (nee O’Toole), was carrying buckets of water about on her head, in Lissindrigan, Co. Galway – about 20 miles away. I was grateful for this additional piece of evidence and thanked Séighean sincerely for thinking of me and passing it on. It felt like I’d just seen another white car … a bit unexpected, pretty unlikely, but nothing to get excited about. Only a few days after that I was suddenly inundated with my metaphorical white cars … there were images of head carrying everywhere! It all started when Charles Mount posted a link to the catalogue of the National Library of Ireland’s online catalogue (read his excellent blog: here). Just on a whim, I decided to search for items tagged ‘head carrying’ or ‘carrying on head’. To be honest, I didn’t hold out much hope of the search returning anything particularly interesting – actually, I didn’t expect it to return anything at all. You can imagine my surprise when I was suddenly confronted with eight images of just this form of portage. 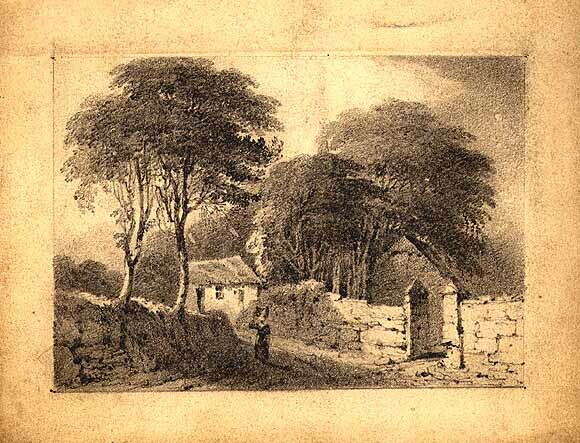 Woman carrying a basket on her head, walking by a cottage beside a demesne wall. Pencil drawing, 9 x 12.8 cm, on sheet 12.7 x 16.6 cm. The oldest of these are dated to the period from 1782 to 1837 and are attributed to the Dublin-born artist Henry Brocas (c.1762 - 1837). The first is described in the Catalogue as ‘woman carrying a basket on her head, walking by a cottage beside a demesne wall’. The figure is relatively small in comparison with the rest of the composition. Nonetheless, there is sufficient detail to see that the figure is carrying a tall-sided container of some sort, steadied by her right hand. The second is described in the NLI catalogue as of ‘a man wearing a cape and a woman carrying a basket on her head’. 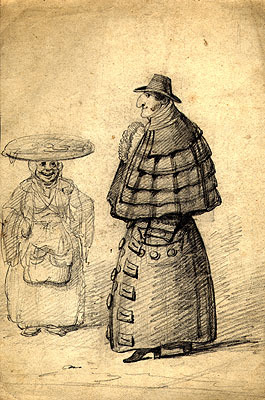 This caricature concentrates on the large-nosed gentleman wearing a multi-layered cloak, frilly-fronted shirt, elaborate buttoned coat, and pointy-toed high-heeled shoes. His gently-smiling, vacant demeanour, suggests that he is unaware of the mirth he is inducing in the woman. She is much less clearly defined - with the exception of her facial features, she is little more than roughly sketched. Despite this, the item on her head appears to be a wide object - either a large platter or a low-sided basket. Whatever the nature of the vessel and her load, she obviously has little difficulty in balancing it on her head, as her hands rest on her hips while she laughs at the gentleman's sartorial flamboyance. Brocas was an best known as an engraver and landscape painter, though he also painted portraits and, as we can see below, was a noted caricaturist. Many of his caricatures were published in the Hibernian magazine. In 1800 he secured the position of master of the Landscape and Ornament School of the Royal Dublin Society. In 1803 he was commissioned by Dublin Castle to produce an engraving of United Irishman Robert Emmet, just prior to his execution. Brocas had four sons, all of whom went on to become painters. James Henry Brocas (1790-1846) is mainly remembered for his paintings of animals. Frederick (1792-1897) and William Brocas (1794-1868) together produced a series of views of Dublin. The latter, like his father, was also known for his political and social caricatures, painted portraits and figures. The youngest son, Henry Jnr. (c. 1798-1873) followed his father as master of the Landscape and Ornament School. A man wearing a cape and a woman carrying a basket on her head. Pencil drawing, 21.7 x 14.7 cm. Two girls with baskets on their heads, a man with a basket and a dog. Watercolour, 16.7 x 13.9 cm. Under normal circumstances I would not be terribly concerned with the lives of the Brocas’ children – no matter how highly they were regarded as artists, or how well they did in their careers. Interestingly, two of these sons play a direct role in this head carrying story. 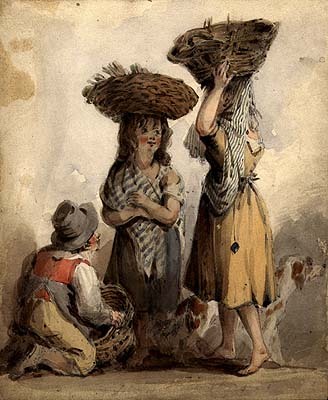 In the collections of the NLI there is a watercolour by the eldest Brocas son, James Henry, described as ‘two girls with baskets on their heads, a man with a basket and a dog’ and is dated to the period from 1810 to 1846. The baskets are large, and relatively crude, wickerwork affairs with sloping sides. One girl, like the young woman in the Spanish Arch postcard, is steadying her basket with her left hand. As an aside it may be noted that the kneeling man (or possibly boy) is wearing a tall, brimmed hat and while he is carrying a broadly similar basket, it would seem unlikely that he intended to carry it in the same manner. William Brocas was, on the current evidence, the most prolific of the family when it came to depicting this form of portage. Two images are dated to the period from 1814 to 1868. The first of these is described as ‘two young women carrying vessels’. 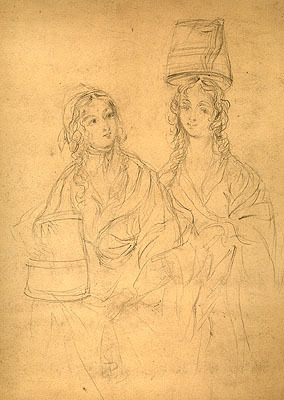 Here two smiling young women with long, flowing hair hold two similar containers. Although only a rough sketch, both vessels appear to be of similar type, tapering towards the top, with a central raised band or rib, and at least one handle. While the figure on the left appears to balance her jug on her only-partially sketched knee, her companion has hers balanced directly on her head – almost to the point where it seems to virtually hover above her, certainly not exerting enough weight to crush her hair! The second work is of ‘three women carrying goods and a man with walking stick’. 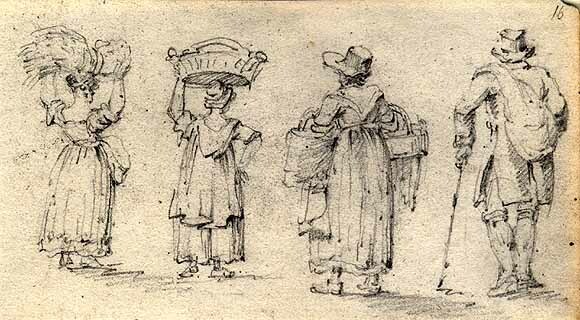 Of the three women, the one on the right has her arms laden with two large baskets with hooped handles. The other two are carrying items on their heads. The figure on the left appears to be carrying a bale or bound collection of material, similar to a large sheaf of corn, and steadied with both hands. The final female figure is balancing what may be interpreted as a wide, low-sided, wicker basket – possibly with a handle – on top of her head, steadied by her left hand, while her other hand rests on her hip. 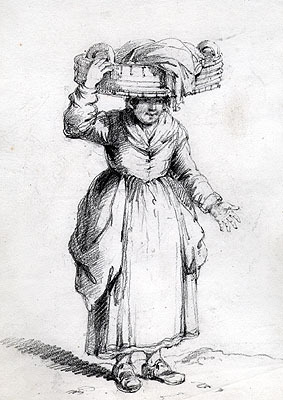 The final Brocas image is described in the catalogue as ‘study of a woman carrying a clothes basket on her head’ and is dated to the period from 1818 to 1868. The basket is again relatively wide, but low-sided. This example has a pair of low, semi-circular, opposed handles. It is difficult to suggest the nature of the material that the basket is made from, but its vertical sides are ribbed and there appears to be an indication of large, even-spaced, stitching along the upper and lower edges. The basket is again steadied by the woman, using her right hand. Two young women carrying vessels. Pencil drawing, 34.4 x 28.1 cm. Three women carrying goods and a man with walking stick. Pencil drawing, 7 x 12.6 cm. The final sketches from the NLI collections are by Sir John Fiennes Twiselton Crampton (1805-1886)[see also: here]. Crampton was an interesting character – he was more concerned with a career in diplomacy than art, it appears. After service in Turin, St. Petersburg, Brussels etc., he was transferred to Washington. In the US he was the cause of a diplomatic spat between his employers and his hosts, as he attempted to enlist American citizens into units to fight for Britain in the Crimean War. Although expelled from America for these actions, and officially reprimanded, he was awarded a KCB (Knight Commander of the Order of the Bath) in 1857. In 1869 he retired from the diplomatic service, moving to Co. Wicklow. Although no details that I have been able to discover about Crampton include his interest in or ability as an artist, the evidence of these pieces indicate that he was not lacking in talent. 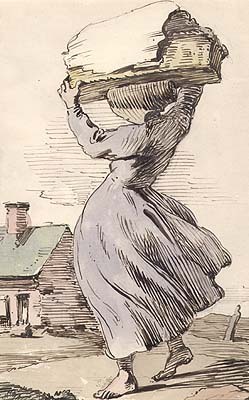 The NLI catalogue describes the subject as ‘woman wearing bonnet and carrying basket on her head’ and is dated to the period between 1825 and 1886. In this image the woman is carting a heavily-loaded, rectangular wicker basket on her head. Her left hand supports the front-left corner, while her other hand is near the back-right corner. As second version, in watercolour, shows an identically-posed woman with a rectangular basket on her head. The folds of her garment, the positions of the feet and hands are all identical with the previous image. The only differences are that in the watercolour she is barefoot; the edging of the fabric covering over the basket is different between the two versions; and in the latter there is a single story house with a central chimney in the background. Given Crampton’s extensive travels as part of this diplomatic career, there is a distinct possibility that this is not of an Irish subject. Even the house in the watercolour is sufficiently generic, in my opinion, to be from one of a number of countries. Nonetheless, it is compatible with an Irish attribution and, barring the rectangular versus circular baskets, it is certainly compatible with the Irish evidence. 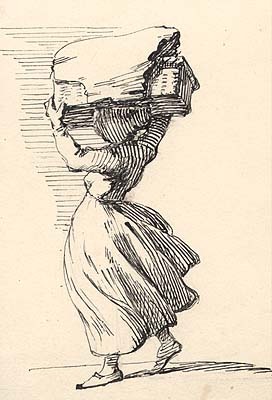 Study of a woman carrying a clothes basket on her head. Pencil drawing, 34.5 x 24.6 cm. Woman wearing bonnet and carrying basket on her head. Ink drawing, 13.5 x 9.3 cm. In the comments to the original post, two people drew my attention to the possibilities that the loads were made more stable and comfortable by the use of an intervening ring of cloth. David Sankey informs me that in British brickyards, up until the 1940s, bricks were commonly carried by young girls, including his own aunt. The boards that they used to carry the bricks were balanced on ‘a thick belt made of rags (they called a bustle)’. Leroy Latty also got in touch to explain that in Jamaica, where women carried loads in a similar manner, a ‘cotta’ or cushion made from cloth or vegetation was used to protect the head. 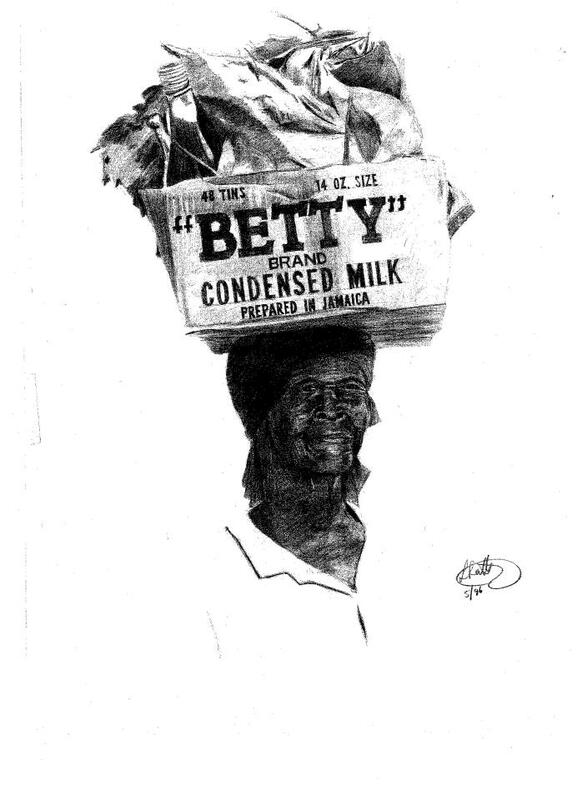 'Betty' carrying a load on her head supported by a cotta. Illustration by Leroy Latty, reproduced by kind permission Original photo image by Adrian Boot in Jamaica: Babylon on a Thin Wire (1977). Schocken Books, New York. Leroy also directed my attention to Edward Long’s 1774 book: “The history of Jamaica. Or, general survey of the antient and modern state of that island”. In Book III, Chapter III, Page 413, the author notes: “The Negroes use their heads, instead of their shoulders, or backs, for carrying all sorts of burthens [sic. ]; with a dried plantain leaf they plait a circular pad, which they call a cotta; upon this, the load rests, and preserves their wool [sic.] from being rubbed off. This custom enlarges, and strengthens, the muscles of their necks, in an amazing degree; and it is really wonderful to observe, what prodigious loads they are able to carry in this manner, with the greatest apparent ease; insomuch, that they will even run with them, and affirm, at the same time, with a laugh, that they feel no weight; perhaps, the perpendicular position of the load, and the equilibre which, from habit, they know well how to give it, produce this facility of carriage, while the incumbent pressure is diminished in proportion to the velocity of their progressive movement under it; this, however, is no more than happens every day with the London porters, some of whom will carry 300lb. weight. The cotta serves likewise for another purpose; on the voluntary divorce of a man and wife, it is cut in two, and each party takes half; as the circle was a symbol of eternity, and the ring of perpetual love or fidelity, so this ceremony, perhaps, is meant to express the eternal severance of their mutual affection”. Woman wearing bonnet and carrying basket on her head. Watercolour 24.3 x 15.2 cm. There is an awful lot to think about in these three sentences, not the least of which is the author’s near-pathological use of commas. In the first instance, this is a solid late 18th century literary account of head carrying that ties well with what we already know from the Medieval skeletons at Tintern Abbey and the various NLI illustrations. Unfortunately, there is no evidence in the NLI illustrations to indicate that a ‘cotta’ or ‘bustle’ was being used in this manner. Indeed, the fact that the majority of examples show the women steadying their loads with their hands may be circumstantial evidence that they did not use such a device. Long’s description also affirms that the same form of portage was not confined to the Jamaican population, but was known among London porters too. The author notes that this activity strengthens the neck muscles, though it may be supposed that many years of it could lead to the elevated numbers of instances of osteophytosis and an increased rate of arthritis of the cervical vertebrae as noted by O’Donnabhain (2010, 116) at Tintern. David Sankey, in reference to his aunt’s work in British brickyards, notes that she blamed the disintegration of two of her vertebrae on having carried loads on her head. However, she also had osteoporosis and David warns against drawing too many parallels between incidences of the condition and claims about head carrying. Finally, and slightly off topic, is the observation that the simple cotta had a larger ‘ritual’ dimension beyond its primary use. This is exactly the type of blurring between the sacred and profane in domestic life that is frequently postulated by prehistorians, but can be so elusive to identify. Leaving aside our digressions into 18th century Jamaica and 20th century British brickyards, where does this leave us? Previously, as far as I was aware, the Irish evidence comprised the Medieval burials at Tintern Abbey, Co. Wexford, and my great-grandmother, Honor Mannion (1869-1947). The addition of the NLI material appears to confirm this as a genuine Irish tradition, and brings the dating back to around 1782. It’s not a huge addition to our knowledge, but it is a start! I have no doubt that this is not the full extent of the evidence and I look forward to seeing new discoveries as they arise. Please feel free to add any additional material that you become aware of in the comments below – maybe, together we can slowly crowd-source the evidence for this lost tradition … keep a look out for white cars! After I finished the main test of this article, I came across a link on the Retronaut site to "Basket Jim" Sainsbury from around 1930 in Covent Garden, London carrying 20 baskets on his head. Just to show that he's not alone in his head carrying, you can easily spot another porter carrying, a much more modest, five baskets on his head in the background. A little further checking brought to light a piece of film from British Pathé, dated 1925, of the same Jim Sainsbury, or the "Covent Garden Cinquevalli" as they call him, practising to defend his title of 'King Carrier'. I am grateful to the National Library of Ireland [Wiki Page | Facebook] for their generous permission to reproduce images from their collection here. I would also like to thank Leroy for introducing me to the word ‘higgler’, which felt so satisfying to say, I was almost positive that it was rude! If you’re anything like me, the mention of the Crimean War will have you thinking that you should, perhaps, read a little bit about it, possibly followed by reading Alfred, Lord Tennyson’s famous poem: The Charge of the Light Brigade. If so, I’ll save you the bother! Have a look at the Crimean War Wiki page here, the Wiki page for the poem here, and the poem itself here. What I didn't realise until I was doing research for this post is that in 1890 (40 years after the original charge) Rudyard Kipling wrote a follow-up, bemoaning the way that the veterans of this charge (and ex-servicemen in general) were treated in their retirement. It is called The Last of the Light Brigade and, despite it being by Kipling, is well worth a read. While you're at it, consider giving a small donation to the Help for Heroes charity.